This paper highlights the emergence of different ‘vocabularies’ that describe various values-driven business functions within large organizations and argues for improved horizontal alignment between them. We investigate two established functions that have long-standing organizational histories: Ethics and Compliance (E&C) and Corporate Social Responsibility (CSR). By drawing upon research on organizational alignment, we explain both the need for and the potential benefit of greater alignment between these values-driven functions. We then examine the structural and socio-cultural dimensions of organizational systems through which E&C and CSR horizontal alignment can be coordinated to improve synergies, address tensions, and generate insight to inform future research and practice in the field of Business and Society. The paper concludes with research questions that can inform future scholarly research and a practical model to guide organizations’ efforts towards inter-functional, horizontal alignment of values-driven organizational practice. ‘Values-driven’ business is generally understood to refer to enterprises that espouse visions, missions and behaviours grounded in ethical values, rather than simply financial considerations or fear of litigation or other sanctions (Barrett 2006; Painter-Morland 2008). Company reports reveal that responsibility for values-driven business is assimilated into corporate environments through diverse functions and activities (Adams and Frost 2008; Searcy and Buslovich 2014). This trend was established as firms responded to pressures to display ethical governance, address social and environmental issues and provide evidence of corporate social performance. These practices lead to the emergence of a variety of ‘vocabularies’, which describe the functions and the job-titles of those involved in institutionalizing values-driven business. We refer to ‘vocabularies’ to reflect on the words, thoughts, systems and actions that pertain to a field, which in this case is values-driven business. From our perspective, vocabularies include not only terminology, but refer to all of the residues of practice, including systems, roles, and behaviours within organizations, both structural and socio-cultural. One result of the impetus towards values-driven business is the plethora of terms that are now used to label these functions (or units), and management roles and practices therein, including ‘ethics’, ‘compliance’, ‘good governance’, ‘anti-corruption’, ‘environmental responsibility’, ‘CSR’ and ‘sustainability’. The proliferation of these vocabularies is indicative of the broad scope of values-driven business activity. Whilst there are some clearly developed organizational functions associated with these labels, a number of questions arise as the values-driven business field matures. The ways in which values-driven business activities interrelate is often ambiguous because they span different levels of the organization and are diverse. Each values-driven function is defined by a set of responsibilities. Different values-driven business functions within a given corporate environment can operate as silos with little or no cooperation and/or integration of efforts (Painter-Morland 2006). For instance, internal ethics programs often had little relationship with externally focused CSR programs. However, according to Treviño (2010), Ethics officers have recently started to view CSR and ethics issues as existing under a shared remit. This has led to a blurring of lines between ethics and CSR roles. Evidence of this blurring of roles is presented by Adobor (2006), who places CSR as one of the core functions of ethics officers. In the meantime, ‘sustainability’ has emerged as a way to refer to CSR and ethics in its more strategic phase, i.e. when CSR and ethics are integral to the company’s long-term survival and success, and the furthering of social and environmental agendas (Montiel 2008). This illustrates the complex way in which ‘vocabularies’ can be a reflection of how various values-driven business roles and functions are implemented and integrated (or not) within an organization. Though research exists on how ethics and compliance officers should implement the ideal ‘ethics management’ or compliance program, and quite a number of scholars have studied CSR integration, there is a need for an in-depth understanding of how these distinct functions can work together towards strengthening values-driven business1. To more systematically evaluate the scope of particular functions and their inter-connections, we draw upon research into alignment. Alignment research draws from various areas of organizational theory (e.g. institutional theory, management systems, performance management) but generally centres upon understanding structural and socio-cultural elements, and their congruence, integration and role in organizational activities and performance. There are relatively few applications of the alignment concept to aspects of values-driven business. Recent literature (Maon et al. 2010; Bondy et al. 2012; Guenther et al. 2016) has started to unpack the structural and socio-cultural sub-systems of management, at vertical corporate, strategic and operational levels. An implicit assumption is that alignment within these various levels can be and needs to be improved, and that doing so will yield positive results. However, scholars who have thus far drawn on the concept of alignment focus on alignment within activities of a single values-driven function such as CSR or environmental management (Basu and Palazzo 2008; Pedersen and Neergaard 2009; Yuan et al. 2011; Parisi 2013). In what follows, we highlight the emergence of vocabularies that describe values-driven business functions (such as ethics, compliance, CSR and sustainability) in large organizations, and identify the need for greater horizontal alignment between these functions. We are interested in values-driven business in general as practised in organizational settings, but given the proliferation of functions, we facilitate and illustrate our discussion by narrowing our focus to two established functions: Ethics and Compliance (E&C) and CSR. We start with a brief overview of these two values-driven business functions and the historical context within which certain ‘vocabularies’ have emerged. Drawing on scholarly research on organizational alignment we propose a model for improving synergies across the structural and socio-cultural dimensions of organizational systems and the multiple units and functions responsible for values-driven business. We do so by identifying areas for meaningful and productive collaboration in the formulation, integration and evaluation phases of values-driven business practice. Our argument is that sharing ‘vocabularies’ across the structural and socio-cultural dimensions of E&C and CSR activities create opportunities for alignment which could strengthen an organization’s values-driven purpose, operations and reporting. We propose a conceptual framework for assessing how the E&C and CSR functions participate in managing values-driven business and identify how these may be aligned. The paper ends with a number of research questions to inform future scholarly work, along with some practical suggestions for alignment between the E&C and CSR functions in practice. Much of the roots of ‘best practice’ in the area of ethics management are American in origin (Weaver et al. 1999). Since multi-national corporations face litigation risks globally, some elements of these best practice models (such as board supervision of ethics, compliance and sustainability, and the adoption of codes of conduct) have now also become common in Europe and in Japan (Kolk 2008). The promulgation of the US Federal Sentencing Guidelines for Organizations in 1991 encouraged business organizations to implement structured E&C programs to proactively fight corporate misconduct, or in cases where it does occur, to be given a reduced fine, or even avoid prosecution altogether (De George 2015). In 2004, the Federal Sentencing Commission re-assessed the compliance-driven approach that it had initially adopted within the Federal Sentencing Guidelines for Organizations (FSGOs) in the light of a spate of corporate scandals. This involved supplementing every reference to ‘compliance’ in the 1991 guidelines with ‘ethics’, making ‘Ethics and Compliance’ the term to describe the function. The revised Guidelines stressed the importance of both ‘ethics’ and ‘compliance’, assigned more responsibility to the governing authority (e.g. Board of Directors) and stressed the need for organizations to promote ‘an organizational culture that encourages ethical conduct and a commitment to compliance with the law.’ The Sarbanes–Oxley Act 2002 requirements added further impetus to the development of E&C programs (Joseph 2002; Desio 2005). In this Anglo-American context, E&C programs, functions and roles, and their associated ‘vocabularies’ emerged against a backdrop of legislative frameworks and organizational responses to risk management. CSR roles and functions emerged against a theoretical backdrop of definitional and conceptual ambiguity (Carroll 1999; Matten and Moon 2008). Whilst writing largely from a US perspective, William C. Frederick’s five phases of CSR (see for example Frederick 1978, 1986, 2008, 2016), trace the evolution of CSR from philanthropic approaches in the 1950s–1960s (CSR1), through managerial responses to social issues (CSR2, 1960s–1970s) and the development of ethical corporate culture and social contracts (CSR3, 1980s–1990s), and a recognition of global ‘citizenship’ responsibilities (CSR4, 1990s–2000s). Finally, CSR5: ‘Sustainability’ (2000–2050) reflects the need for a holistic, integrated solution involving the global ‘sustainability’ responsibilities of governments, organizations, citizens and corporations (Frederick 2016). Overlapping concepts such as ‘corporate social performance’ (Wood 1991); ‘sustainability’ and the triple bottom line (Elkington 1998); ‘corporate citizenship’ (Matten and Crane 2005); ‘corporate accountability’ (Gray et al. 1996); strategic CSR (Porter and Kramer 2006); ‘political CSR’ (Scherer and Palazzo 2011) and the ‘value-enhancing’ capabilities of CSR (Malik 2015) also represent important bodies of literature with associated ‘vocabularies’ under the umbrella term CSR. Legal frameworks such as the UK Companies Act (2006); the Climate Change Act (2008); the US Sarbannes-Oxley Act (2002), and various UN and ILO international standards have also shaped the incorporation of CSR into business practice (Bondy et al. 2012). For the purposes of this paper, we use the term ‘CSR’ to encompass both ‘CSR and Sustainability practices’, recognizing that whilst the terms have evolved from different histories and distinct scholarly literatures, they reflect a unified push towards a common future that balances economic, social and environmental priorities (Montiel 2008; Frederick 2016). A range of contextual factors influence what is expected of those individuals in E&C and CSR roles. Matten and Moon (2008) point to various macro- and meso-level forces that shape approaches to values-driven business including systems of politics, finance, education, labour, culture and markets, alongside the nature of the firm and systems of coordination and control. In literature that focuses upon firm level factors, organization size and type are primary distinctions, for example research has centred upon either large multi-national corporations (Bondy et al. 2012) or small–medium-sized enterprises (Castka et al. 2004). The stage of CSR development is another key factor. Maon et al. (2010) distinguish amongst organizations that range from a dismissive position through to a proactive and transformative approach, and characterize differences in their CSR implementation at corporate, strategic and operational level. Organizations at a relatively early stage of CSR and E&C development often adopt a ‘compliance seeking stance’ and are more likely to only set compliance goals; use policy development primarily as a vehicle for implementation; communicate unilaterally with stakeholders; favour internal reporting and address integration through a single business function (Krell 2009; Moan et al. 2010). By contrast, where an organizational culture is more embedded in organizations that adopt a ‘strategizing’ approach to values-driven business, they are more likely to set goals to establish themselves as leaders in E&C and CSR, for example, by working towards system-wide implementation; engaging in collaborative communications with stakeholders; adopting certified reporting and adjusting organizational alignment to accommodate E&C and CSR as core to business strategy (Jaeger and Lags 2009). Similarly, the maturity of ethics programs influences the extent to which an organization adopts compliance versus values-driven approach and determines whether it is more reactive than proactive. Truly integrated, proactive programs seem hard to establish, as illustrated by a study that found that more than half of programs tend to be reactive in nature (Jaeger and Lags 2009). More mature programs tend to comfortably combine values-driven approaches with compliance, whereas young programs often tend to lean more towards legal compliance (Bonime-Blanc and Coyne 2014). In addition, idiosyncratic organizational factors lead to variability in the specification of values-driven management roles. In order to appreciate the dominant vocabularies in the Ethics & Compliance and CSR functions, we cannot overlook the role of various national and international quasi-professional institutions and professional organizations have emerged which act as professional membership and certification bodies for E&C and CSR managers. For E&C professionals the first to emerge was the Ethics Officer Association (EOA) in 1992, which was later renamed the Ethics and Compliance Association (ECOA), indicating the extent to which E&C is being considered as two sides of the same coin. This organization is now called the Ethics and Compliance Initiative (ECI 2016), and it includes the previously independent Ethics Resource Center as its research arm. Other important players include the Society for Corporate Compliance and Ethics (SCCE)2, and the UK-based Institute for Business Ethics, which also brings practitioners from across Europe together for training and peer-support. The FSGOs also played a pivotal role in the development of the E&C profession, particularly because these roles developed largely in response to external legitimacy challenges faced by organizations (Treviño et al. 2014, p. 191). Other prominent bodies for CSR (and E&C practitioners) include the Institute for Corporate Responsibility and Sustainability (ICRS); Business in the Community (BITC); the Institute for Business Ethics (IBE) and the Global Association of Corporate Sustainability Officers (GACSO) in the UK; as well as the Corporate Responsibility Association (CRA); the Association of Corporate Contributions Professionals (ACCP) and the International Society of Sustainability Professionals (ISSP) in the US. Such professional bodies provide various networking training and accreditation opportunities, all of which can further enhance the institutionalization of associated vocabularies within specific functions and industries. Consequently, E&C and CSR practitioners exist against a complex historical backdrop which has contributed to the emergence of multiple ‘vocabularies’ associated with these roles, responsibilities and functions, and differing corporate and geographical interpretations of what it means to promote values-driven business. Therefore, the need for clarity and the identification of opportunities for alignment on the implementation of E&C and CSR becomes more urgent. Alignment is a long-standing area of research in management, strategy, and organization studies, given its importance for organizational performance (Hitt et al. 1982; Fonvielle and Carr 2001; Schepereel 2006; Kaplan and Norton 2006). It is defined as ‘the degree to which the needs, demands, goals, objectives, and/or structures of one component are consistent with the needs, demands, goals, objectives, and/or structures of another component’ (Nadler and Tushman 1980, p. 45). Theoretical work in this area examines alignment synonymously with concepts such as ‘matched with’, ‘contingent upon’, ‘consistent with’, ‘fit’, and ‘congruent’ (Venkatraman 1989). Literature in this field often covers organizations’ strategic alignment with external conditions, but in this paper we draw upon the research on internal alignment, which is concerned with the fit between organizational elements pertaining to strategies, systems, processes and people (Venkatraman and Camillus 1984). The literature on internal alignment has largely developed with a focus on vertical fit, involving ‘the configuration of strategies, objectives, action plans, and decisions throughout the various levels of the organization’ (Kathuria et al. 2007, p. 505). Vertical fit (Kathuria et al. 2007) involves strategies, objectives, action plans, and decisions throughout the corporate, strategic, and functional levels (Hayes and Wheelwright 1984; Skinner 1985), which are interlinked within a hierarchical understanding of the organization. Vertical alignment is accomplished when lower-level decisions regarding structures and systems are consistent with upper levels (hierarchical) strategy (Kathuria and Porth 2003). The focus of CSR scholars interested in alignment has by and large been on vertical alignment—alignment between the various elements of CSR and the overall performance (economic, social, or environmental) accomplished by the organization. CSR has arguably been institutionalized through integration across the phases of strategy formation and implementation (Maon et al. 2010; Bondy et al. 2012) and CSR practices have been studied in relation to vertical fit both internal and external to the organization (Yuan et al. 2011). Basu and Palazzo (2008) have insightfully examined the impact of the institutional context within which CSR is embedded, such as mental frames and sense-making processes, on organization’s overall strategy. In a similar vein, E&C officers carry out important alignment work in relation to the organization’s strategy. For example, E&C officers are tasked with aligning the organization’s stated values with strategic decision-making, human resources practices and corporate communication (Weaver and Treviño 2001; Vickers 2005; Segon and Practitioners 2010). Compliance officers in turn focus mostly on aligning legal compliance measures (Gnazzo 2011). A much smaller literature addresses horizontal alignment. Recent reviews reveal a growing focus on cooperating and coordinating efforts and practices in pursuit of organizational goals across an organization (Kathuria et al. 2007; Wood 1999). Research on horizontal alignment addresses both inter- and intra-functional elements, that is, the fit between various aspects of work within a given function as well as fit among the different functions and their interactions within an organization. Horizontal fit has been a particular focus within human resource (HR) management literature to examine whether HR systems are effective at an aggregate (vs. individual) level and supports organizational strategy (Schuler and Jackson 1987; Delery 1998; Gerhart 2007; Kepes and Delery 2007). HR’s role in ethics programs has also been debated within the business literature (Vickers 2005; Segon and Practitioners 2010). Scholars have noted important challenges regarding methods and empirical measurement in the study of horizontal alignment (Lengnick-Hall et al. 2009 ; Samnani and Singh 2013). And since alignment research pertains to organizational structure and context in relation to organizational performance, we need an understanding of the intersection between horizontal alignment and hierarchical/vertical alignment. A number of scholars have begun to raise concerns about this intersection gap regarding how practices align with key business strategy, on the one hand, and with one another, on the other hand (Kathuria et al. 2007; Lengnick-Hall et al. 2009; Werbel and DeMarie 2005). In this article, we address this problem in the context of values-driven business. Specifically, we ask: how are values-driven practices aligned horizontally with one another, and what the shared ‘vocabularies’ among them can accomplish for organizations in pursuit of their values-driven business goals and strategies. Much of the research that examines the problem of how to achieve alignment appears in the management, strategy, and management control systems literatures (Chenhall 2005; Guenther et al. 2016; Otley 1999; Reich and Benbasat 2000). This literature recognizes the need to examine both structural and socio-cultural aspects of management to understand processes that structure organizational activity and ways to improve strategic integration. Structural alignment is defined as fit between internal structures, systems, processes, strategies, and planning systems (Chenhall 2005). It aims to reduce overlaps in responsibility, while enabling collaboration, increasing efficiency and effectiveness and reducing ambiguities about accountability. In a given organizational context, structural alignment can address the coordination and interface between HR policies, manufacturing operations, information systems, etc. (i.e. horizontal alignment) on the one hand, and the organization’s corporate strategy and overall structure, on the other hand (vertical alignment). In contrast, socio-cultural alignment involves social and cultural processes that facilitate shared understanding and a match between individuals’ beliefs, values, purpose and habits with those of the organization (Reich and Benbasat 2000; Bansal 2003). Within this body of literature, socio-cultural processes have been conceived in a variety of ways (Chenhall 2005), for instance, as socialization processes (Abernethy and Brownwell 1997; Akesson and Skalen 2011), social group influences (Merchant 1985), and institutionalized values, norms and rules (Yuan et al. 2011). 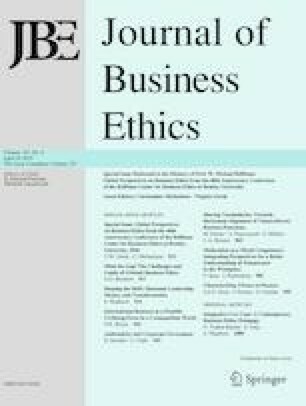 We propose that the structural and socio-cultural processes of the values-driven business can be examined to assess how values-driven responsibilities and practices are (or are not) aligned horizontally across functions, and how an approach of sharing ‘vocabularies’ could support values-driven business goals and strategies. Applied to the values-driven business, a horizontal analysis can involve, for example, the alignment of structures, rules, policies, norms, values, and commitments within an E&C unit, as well as the alignment or misalignment of these same elements in relation to the CSR unit. The way in which E&C and CSR could collaborate towards values-driven business has yet to be studied in the academic literature and we propose that it can be fruitfully examined using the conceptual apparatus of alignment. In the remainder of the paper, we adopt both the structural and socio-cultural process lens in an effort to better understand alignment between the two functions under analysis. We specifically highlight horizontal alignment, which by definition has a two-fold characteristic: (i) it takes place at the functional and intra-functional levels, and (ii) it must operate in conjunction with vertical alignment (Kathuria et. al. 2007) in order to be impactful. We know little about these two elements of horizontal alignment pertaining to the E&C and CSR functions, and so we draw on our proposed conceptual framework in the remainder of the article to shed light on this feature of values-driven business practice. Responsibilities attributed to values-driven business functions—certainly E&C and CSR, which are our focus here—typically extend to the integration of their principles into activities from operational through to strategic and corporate levels of the organization (Joshi et al. 2003). In other words, existing research on values-driven business focuses on the vertical alignment between each function and the hierarchy of levels in a given organization. Therefore, our evaluation of horizontal alignment needs to consider the fit between different values-driven business functions alongside their vertical alignment with each level of the organization. To bring the focus to domains of responsibility that are of specific relevance to value-based business functions, we draw upon the literature that discusses CSR integration (Bondy et al. 2012) and ethics management (Painter-Morland 2008, 2015). This literature frames these vertical connections as ‘phases’ in the implementation of values-driven business, i.e. (1) the corporate/strategy formulation phase, (2) integration phase, operating through the systems development and implementation, and (3) the evaluation phase. For each phase: Formulation, Integration and Evaluation, we discuss horizontal alignment through the consideration of both the structural and socio-cultural processes involved, (a summary of the key elements are mapped in Table 1). In practice, E&C and CSR officers play different but often related roles across the three phases, yet there seems to be no standard consensus on who plays which roles. To get a sense of how the diversity of values-driven roles and vocabularies emerged within corporate practice, one has to look beyond the academic literature and into the realm of practice. Diversity of practice could lead to confusion across contexts, and also raises the question of whether a single model of organizing values-driven business could be viable. We therefore need to emphasize that evaluation of alignment opportunities will need to account for the idiosyncratic circumstance in particular organizations. It is also worth noting that in our discussion, we start from the premise that alignment is likely to deliver benefits and that it is valuable for organizations to be able to identify and evaluate alignment in an effort to achieve greater organizational congruence. However, we note that a perfect ‘fit’ is unlikely and may not always be desirable (Parisi 2013) and research is needed to understand the benefits and detrimental effects of various facets of alignment in the values-driven business context. In the ‘formulation’ phase of values-driven business practices, the emphasis is on identifying the values that the organization is committed to, in line with its overall strategic direction, i.e. its mission and vision. Formulating value-commitments with true ethical intent means conducting one’s business according to lived values, serving and protecting stakeholder interests and properly integrating the organization’s values with the organization’s overall strategic direction (Painter-Morland 2008). This process should involve stakeholder engagement, plus some assessment of the beliefs, practices and artefacts that contribute to an ethical organizational context (Weaver et al. 1999). During this phase, the risks that the organization faces must be taken into consideration, in order to inform the formulation of strategic targets and goals and short, medium and long-term performance objectives. It is also important for the organization to consider relevant global and industry-specific standards, codes and regulations. As such, the ‘formulation phase’ of values-driven business has to be initiated at the Board level, driven by executive commitment and involve the organization as a whole, with the input of various individuals employed in roles related to values-driven business. Ultimately a balance is required of access to the highest governing bodies of the organization while remaining close enough to stakeholders to get input on all material issues related to values-driven business (See Table 1). There is considerable diversity in the responsibilities and level of seniority of managers in values-driven business functions. Nonetheless, as both the E&C and CSR professions have developed, and progress has been made on the vertical integration of these functions into the organization, even middle managers contribute in some way to corporate governance and strategic decision-making (Galbreath 2009). They are often engaged in the ‘formulation phase’ because they have expertise relevant to governance, values, and strategy (and their precursors of mission and vision), and performance and risk as they relate to internal and external stakeholders (Arjoon 2005; Harjoto and Jo 2011) and complement traditional economically focused approaches (Galbreath 2010). This phase may also introduce new activity, for instance, the formulation of mission and vision may lead to development of a code of conduct alongside a strategy and even a code of conduct for the board of directors (Schwartz 2005). Socio-cultural processes, whether viewed as micro-, meso- or macro-level forces (Aguilera et al. 2007), are also critical to align values-driven business. In the first place, a very important socio-cultural factor in the formulation phase, is how values-driven business is motivated, and how the ‘business case’ for values-driven business is substantiated (Painter-Morland 2008). This involves analysing how sound ethical and socially responsible business practices can help mitigate risks, limit liability, help the organization develop a competitive advantage, attract and retain top talent, create productive and healthy workplace cultures and build strong ethical reputation amongst all stakeholder of the organization, including investors, customers and suppliers that prefer to do business with ethical organizations (Margolis et al. 2001). Since the way in which the organization allocates its resources signals its commitment to values, it is also important to assign budget to values-driven priorities (such as training, etc). Another important, related dimension is ongoing stakeholder engagement, which is crucial in the formulation phase but continues to play a role in the integration and evaluation phases. Stakeholder engagement is central to the activities of both E&C and CSR functions and is key to bringing about a broad understanding of social and ethical issues that pertain to the organization. Scholarship has examined the processes of CSR integration, applying stakeholder theory (Maon et al. 2009) to understand organizational responses to the distal pressures from outside the organization (e.g. government, civil society, market/industry institutions) and the more proximal influence of stakeholders. Stakeholder theory clearly advocates that ethics has a role at the heart of corporate strategy. Indeed, Freeman’s (2010) analysis of stakeholder theory is built on a rejection of the separation thesis, i.e. it rejects the notion that business can function separately from normative concerns. However, the particular emphasis of stakeholder engagement may vary across functions, for instance, an E&C officer in a financial services organization may focus upon the firm’s legal responsibilities relating to fraud prevention and consumer protection while the CSR officer focuses on environmental impacts and community contributions4. There may also be points of overlap, for instance, in the domain of human resources. The most important socio-cultural factor in the formulation phase of values-driven business is related to the need to set the ‘tone at the top’, i.e. for the top executives of the organization to be committed to values-driven business (Driscoll and Hoffman 1999). While E&C and CSR functions can help to create an organizational context in which the culture and climate foster values-based role modelling, reasoning, routines, etc. across the business, it is particularly important that this is achieved at board and senior management level, given that leadership is so critical to ‘better business’ (Angu-Leppan et al. 2010). Indeed, board habits have been blamed for some of the most infamous corporate scandals of recent years. For example, Enron’s ‘PowerPoint’ board hardly ever read the detailed documentation ahead of board meetings and implicitly trusted talented executives like Skilling with decision making, with detrimental effects. During the integration phase, systems are developed for values-driven management over time (See Table 1: columns I1 and I2). Integration of values-driven business requires the formulation of codes of ethics/ business conduct, or values statements, and the development of policies and procedures to put these into practice. The clearest formulation of what a program of values-integration entails, at least in the E&C arena, are the various steps of the US Federal Sentencing Guidelines, which stipulates that it involves developing codes of conduct, assigning senior individuals responsibilities for ethics, taking due care when delegating discretionary authority, communication the values and conducting training, setting up hotline and helplines, performing ongoing monitoring and reporting, and preventing the recurrence of ethical failures through continual improvement and alignment (Painter-Morland 2015). Many of these steps involve the structural dimensions of the organization—i.e. formal roles, policies and procedures that support structures for values-driven business. There is potential to align the structures that the E&C and CSR functions manage and utilize to contribute to consistency across the organization and communicate organizational integrity to all stakeholders, both internal and external. Internally, there is a growing trend towards embedding ethics and values-based performance across management control systems, including performance management. Externally, it is important to embed values across the entire value-chain and ensure that rewards are aligned with organizational values. The way in which structural elements are configured, alongside the socio-cultural processes outlined below, influences vertical alignment with organizational strategy (Pollach et al. 2012). It also shapes horizontal alignment with other functional areas of the business, which is key to embedding values across the organization. The pattern of horizontal alignment with other business activity is likely to differ for particular values-driven functions, for example, E&C officers may work more directly with financial risk management, HR, procurement officers and legal counsel, whereas CSR officers may work closely with communications and marketing, HR, procurement officers, supply-chain managers, environmental risk managers and corporate foundation managers. Literature within the distinct fields of values-driven business provides insight into organizational structures that enable vertical integration by each function (Morioka and Carvalho 2016) and illuminates processes of horizontal integration (Gond et al. 2011). However, we lack research that examines the alignment of multiple values-driven functions with each other, the points of overlap, and the different ways in which they interface with organizational structures. Descriptive research is needed as a starting point, but there is also a need for explanatory studies that provide understanding of the forces that shape (and are shaped by) horizontal alignment of functions such as E&C and CSR. From a socio-cultural perspective, the importance being placed on building values-based organizational cultures across all organizational functions, both within the E&C field (Petry 2005; Kaptein 2009) and CSR (Crane et al. 2008) cannot be underestimated. Hence it is critical to understand the socio-cultural processes at work at the integration phase. Literature recognizes that these can be examined at a macro-, micro- and meso-level (Aguilera et al. 2007), although meso-level analyses that focus upon the organizational environment are most prominent. Literature emphasizes the role of rules, routines and symbolic artefacts (e.g. language, logos, reports) in shaping organizational activity over time (Bonime-Blanc and Coyne 2014). In the same way that these forces have been credited with positive organizational change, ethical failures have been attributed to embedded organizational scripts, routines and practices. For instance, Enron’s culture of ruthless completion was part of how people in the organization talked, relaxed, and most importantly, it was supported by how employees were rewarded (Spector et al. 2009; Willmott 2011). In such contexts, an E&C program, if it is sincerely instituted, is faced with disrupting existing paradigms and the scripts that continue to support and strengthen existing unethical behaviour through activity that counters existing rationalizations and evolving new ways of speaking and acting. This is the type of approach that is followed in ‘Giving Voice to Values’ training and education programs (Gentile 2010, 2011, 2012). This is not to suggest that the process of change is linear and cohesive. Rather attention is needed to the interplay between actors and various areas of activity to understand how values are ‘made to fit’ (Ansari et al. 2010) across the business over time, through proactive initiatives and in response to formative events (Chandler 2014). The diverse patterns of change that might be found at the integration phase and operational levels are illustrated by Yuan et al. (2011) who present various models for integrating CSR in organizations via routinized practices that range from core to peripheral. For instance, CSR practices that are peripheral but extend into core elements of the organization, like an accounting firm supporting maths and accountancy education in developing countries to enlarge their recruitment base in these areas, are labelled as ‘thickening’ strategies. Another strategy is ‘trimming’, which involves eliminating routines detrimental to CSR (Yuan et al. 2011), for instance eliminating waste through new routines and practices. Ethics officers may adopt similar strategies to encourage values-driven behaviours. Current evidence on the integration of HR with a single values-driven function (CSR) suggests that such a development is likely to have positive impacts (Gond et al. 2011). However, research is needed to understand the areas of synergy and tension that characterize socio-cultural processes of alignment when multiple values-driven functions come together. Internal awareness raising is crucial in sending consistent messages about the importance of values-driven business. Communication campaigns around the organization’s values, decision-making tips, dissemination of resources and support that is available, such as prominently displaying hotline and helpline numbers, are all important (Driscoll and Hoffman 1999). Joining forces in planning and executing such communication campaign could strengthen both the E&C and CSR functions, save time and stretch budgets. This is not only important within the organization itself, but also involves consistent messaging about values to be integrated into stakeholder communication. This would for instance involve the implementation of supplier codes of conduct, ethical criteria within the procurement process, ongoing monitoring of supplier conduct. The values that the E&C function is tasked to embed, could also be strengthened by CSR initiatives that encourage employees to engage in purpose-driven community service, establish work–life balance, and implement sustainable water-use mechanisms. All dimensions of values-driven business require the adoption of certain routine practices as part of everyday business operations, or that strengthens the core elements of the organization. Central to values-based business is ongoing stakeholder dialogue, gathering feedback and integrating such feedback into organizational practice. If alignment could be accomplished, this could involve joint surveys or focus group sessions co-hosted by the E&C and CSR functions. Another crucial socio-cultural factor that is important in the integration phase involves protecting whistle-blowers against retaliation. E&C practitioners report that fear of retaliation is the single most serious challenge that they face in implementing an ethics and compliance program (Ethics Resource Centre 2016). Within the evaluation phase, the organization is concerned with proactively monitoring risks as they emerge within organizational practice and gathering the required information to report on organizational compliance and other values-driven initiatives, both internally and externally. Values-driven functions within a business therefore have extensive responsibilities for internal monitoring, risk management and external reporting. In many cases, formal structures such as Ethics Oversight Boards, or other Board committees are established and E&C and CSR officers report to these on a regular basis. Research highlights that a wide variety of functions and management roles are involved, depending on a variety of organizational contextual factors as well as the organization and structure of reporting at an operational level (e.g. audit and review processes, reporting periods, lines of reporting, communication formats, IT systems) that influence and constrain reporting practices (Adams and Frost 2008). As with other structural elements, reporting systems evolve through the cycles of design and implementation, in proactive and reactive efforts to fit them with the needs of the organization and its stakeholders (Searcy 2012). From a socio-cultural perspective, the evaluation phase often involves culture audits to establish how employees perceive values-driven business practices within the organization. Changes in the organizational culture and the emergence of new risks may then feed back into a new formulation phase, during which the organization’s values are re-assessed and reformulated. It is also important to review stakeholder feedback at this stage, and to engage in dispute resolution as and when necessary5. This phase involves reassessing training and communication to address any new risks (Driscoll and Hoffman 1999) and may involve the cultivation of professional virtues, for instance on the audit committee reporting to the Board. Ethical habituation starts with professional values and an understanding of the societal duties of professionals and, as such, plays a key role in the ethical functioning of accounting and reporting oversight (See Table 1: columns E1 and E2). However, the picture of current practice presented by Adams and Frost (2008) is one of considerable confusion. Adams and Frost (2008) indicate that organizational reporting based upon environmental and social indicators may be negatively impacted by a lack of alignment. With diverse teams contributing to integrated reporting, there are alternative views on what should be reported and rationalization of how performance should be evidenced. In conclusion, they note: ‘No wonder then that their views on where they should go in the future also varied… the finance department at D (British utility) had started to investigate the possibility of introducing environmental accounting. In the future A (British Bank) wants to do more work on ethical screening of the parent companies of suppliers and improve the way they measure what they do in the community’ (Adams and Frost 2008, p. 299). There is considerable scope for the intersection of values-driven functions in relation to the measurement and reporting of data gathered in one area, which could be important for identifying risk areas in another. In the case of internal monitoring and reporting, for example, work-life balance data is relevant to CSR but also key to understanding fraud and corruption risks. For example, employees who feel that they are being spread too thinly and have no life outside work are more likely to rationalize the cutting of corners or ‘getting their own back’ via fraud and corruption (Kusserow 2017). When it comes to auditing and external reporting, both functions are gathering data that help fulfil the organization’s due diligence requirements, though the interaction in planning auditing and reporting processes varies (Searcy and Buslovich 2014). The E&C officer is typically involved in reporting on the E&C program, its training and awareness campaigns, reports of misconduct, investigations and sanctions and plans for preventing its reoccurrence via risk management strategies. The CSR officer may be involved in one or a variety of reports, for which labels include but are not limited to reports on Society, Human Rights, Social Responsibility and Sustainability. A company like Unilever, for instance, publishes a report on their Sustainable Living Plan, plus a separate Human Rights Report, in additional to Environmental Assurance statements (See footnote no. 8). It is hard to imagine that companies can compile a meaningful report if E&C and CSR officers and other values-driven functions do not collaborate closely on the auditing, monitoring and reporting elements that form part of their respective roles. However, progressing towards greater alignment in monitoring, auditing and reporting is not solely a matter of adapting the organization of this activity and structures; research is also needed to understand how each function’s socio-cultural processes relating to this activity can facilitate and constrain alignment efforts. Scholars have highlighted that attitudes to reporting impact the ‘‘extensiveness, quality, quantity and completeness of reporting’’ (Adams 2002, p. 244) and in more recent empirical work Adams and McNicholas (2007) conclude that the personal perspectives of the management team heavily influenced the nature of reporting. Further, attitudes to the potential use of reports, directly, conceptually and symbolically influences this area of practice (Searcy 2012). In order to inform scholarly research agendas going forward, and to assist practitioners in moving towards greater alignment between the E&C and CSR functions, we developed a process model that could be used to highlight specific questions at each stage of the alignment process. The model depicted below (Fig. 1) is designed to guide organizations’ efforts towards inter-functional, horizontal alignment across values-driven business functions within their own organizational context. Specifically, it sets out a five stage process: (1) determine the degree of (mis)alignment in values-driven business functions and its consequences, (2) determine priorities for values-driven business alignment, (3) set objectives in priority areas and determine indicators of progress on alignment, (4) identify structural and socio-cultural enablers of, and barriers to, values-driven business alignment in priority areas and (5) outline a roadmap for values-driven business alignment and evaluate progress. The application of this process to particular contexts first addresses questions about what needs to be aligned and why and, secondly, how to work towards alignment in this area. In the first phase of the model, i.e. identifying potential alignment/ misalignment, practitioners could use Table 1 as a practice tool to establish in which tasks each of the values-driven functions are engaged. The individuals involved in each area could indicate their functions and roles and highlight overlaps. From a research perspective, a macro-analysis of best practices within corporations would enable reflection on which structures work best in specific industries, and how the size of an organization, and the maturity of its E&C or CSR programs influence decisions on how to structure values-driven business. One of the important gaps in the research lies in understanding how values-driven business functions are represented within teams addressing strategy, policy and rewards and how this may strengthen both the E&C and CSR officers’ functioning. For instance, can common or different structural elements be deployed to gather, disseminate and respond to stakeholder concerns? Are there shared systems and processes for risk assessment, auditing and reporting activity or, at least, points of intersection? Are processes of internal collaboration with other business functions shared or unconnected? Is training relating to E&C and CSR integrated or separate? Are these activities facilitated through similar or different structures, and why? It would also be interesting to determine how many, and what types of organizations have structures that align values-driven functions with each other. Is this accomplished through a board level position that represents E&C and CSR in combination with other values-driven functions such as environmental management? Does a senior level manager represent multiple functions? Or, are several distinct functions involved? How do these different structural arrangements work and what are the implications? Is it more common for organizations to adopt a dispersed approach in which, for example, there are different lines through to the board (e.g. E&C reports via the Legal/Compliance functions and CSR reports via HR). If so, is there a clear, rationale from a strategic governance perspective or has the structure evolved due to the history of each function within the organization? In terms of defining priorities for alignment, it would be crucial to ask distinct questions around both the structural and socio-cultural dimensions of the organization that play key roles in values-driven business. Research into the ‘what’ and ‘why’ questions can build understanding of the components of alignment that organizations recognize at the formulation, implementation and evaluation stages of the alignment process. While extant literature highlights the benefits of alignment generally, or in relation to functions such as human resources or IT (Garavan 2007), there is a lack of research on these issues for values-driven business. By revealing the areas in which there are overlaps or failure to leverage the work of values-driven business functions and organizations’ views of the negative consequences or potential benefits of alignment, there is an opportunity for scholars to critically examine organizations’ priorities and reasons to integrate values-driven business. This includes assessing strategic opportunities (innovation, anticipating future requirements to respond to regulatory, competitive or social values forces), tactical decisions (better allocation of resources, achieving efficiency, greater compatibility of organizational culture), as well as the contributions it makes to organizational performance. These are salient questions to understand where there are opportunities to improve the synergies between values-driven functions, and to set priorities that are most likely to contribute to social performance and social and political legitimacy both internally and externally. The identification of important structural and socio-cultural enablers is the next step. In which ways can each values-driven function shape organizational cultures and climates? Are differences that arise from structural (e.g. management responsibilities) and professional factors (e.g. training, experience), likely to give rise to alternative norms and rules, habitual activities and ways of thinking? When these converge at corporate and strategic business development levels, which socio-cultural processes facilitate and inhibit progress towards a shared understanding at the top of the organization? Are opportunities for moral and ethical aspects of organizational learning sufficiently exploited and does it promote proactive change? Research could reveal useful comparisons relating to socio-cultural processes that are inherent to the horizontal integration of values-driven functions. For example, particular functions can play mutually supportive yet distinct roles. CSR might be more focused on awareness raising and influencing the organizational culture, while greater emphasis is placed on the responsibility of E&C to monitor and report on business conduct training, and flag up risks that are revealed through the organization’s hotline and/ or helpline. Together, they may deliberate on what gives rise to those patterns (e.g. structural factors, professional competencies and experience). The legal prowess of E&C officers may be productively combined with the communication skills and stakeholder influence of CSR officers when it comes to convincing the Board of certain improvements in ethical business practice. In addition, a primary question that arises about horizontal integration of values-driven functions is whether the socio-cultural processes that shape systems and implementation processes are consolidated when there is greater structural alignment of the functions. Do they, as a result, have potential to become more pervasive and faithful to a core set of organizational values? For example, E&C officers and CSR officers both have an interest in a close cooperation with HR because recruitment, training, performance management and retention support their respective objectives. If there are stronger mechanisms for coordinating the horizontal integration of E&C and CSR with HR systems and processes, does it have positive implications for embedding a values-driven culture? Once some of these questions have been answered, the organization will be better equipped to create a tailor-made roadmap to use in pursuit of greater horizontal alignment between E&C and CSR functions. There are multiple further research opportunities associated with horizontal alignment between E&C and CSR functions. As discussed previously, this is likely to vary for organizations of different types and in different contexts. It also provides opportunity to study challenges of organizing values-driven business at points of crisis and change, for instance, when scandals arise for individual companies or whole sectors or when they face mergers and acquisitions or the development of strategic partnerships. Over forty years since Sethi (1975) highlighted concerns about alignment issues in the study of corporate social performance, values-driven business has developed and institutionalized extensively, supported by scholarship providing insight into both structural and socio-cultural processes (van Marrewijk 2003; Basu and Palazzo 2008). However, the practices that emerged, and the ‘vocabularies’ that emerged in its wake, have somehow undermined rather than supported organizational alignment towards values-driven business. Though there is considerable research that examines the vertical integration of values-driven business functions into organizations, this literature is predominantly developed within siloed streams of work. This neglects the problem of the horizontal alignment of different values-driven functions, which is a growing challenge as multiple functions emerge in particular settings that often lack coordinating mechanisms. Our investigation thus far has provided us with significant insight regarding possible areas of alignment between the E&C and CSR functions in large corporations. These functions share responsibilities for certain important organizational tasks, such as creating cultures of integrity, raising awareness around values, embedding values-driven practices in operational areas, as well as monitoring and reporting. They also bring to the table a variety of skills and competencies that may be mutually supportive in establishing values-driven business practices and responsible reporting. One of course needs to avoid generalizations as any such cooperation will depend on the distinct individuals involved. However, it does seem that the functions can be mutually complementary. In fact, both functions are responsible for ensuring that organizational commitment to values is a lived practice, rather than words on paper or window-dressing. Our historical analysis enabled us to highlight that the global development of E&C and CSR functions is influenced by specific contextual dynamics. The promulgation of legislation and forms of ‘soft law’ has encouraged corporations to step up their efforts both in E&C and CSR. In turn, the age of the programs and the stage of their development, are crucial for understanding the position of the function and its integration across various operational areas. Over time, organizations that may have started with a strict compliance mentality have become more values-driven and as such, it may be easier for such organizations to embrace a broader alignment with CSR as part of their organization’s values-driven business commitments. In certain industries, litigation threats remain prominent, which requires an emphasis on compliance. In some of these cases, it may make more sense for organizations to delegate the aspirational and community dimensions of CSR to corporate foundations and to focus internal functions on risk management (especially health and safety and environmental risks). We are therefore cognizant of the fact that there are distinct limitations to the current study. Our analyses show the importance of acknowledging a broader national, international, institutional and industry context for understanding the integration of E&C and CSR, and currently our analysis cannot accommodate this level of detail. Instead, this paper focuses on understanding various aspects of alignment within large organizations and the question of whether and how various functions with responsibilities for values-driven business can work together within organizations. This highlights another limitation: currently the question of horizontal alignment is one that only arises in large organizations; hence, we primarily draw upon research based on larger organizations as we examine these issues. It may be the case that in SMEs, integration is already at work because of limited resources and staff capacity. Or that E&C and CSR personnel are essentially misnomers subsumed within smaller organizations' strategy on social responsiveness according to organizational values, which is often shaped and directed by the personal or family values of founder(s) of the firm – see Anita Roddick’s Body Shop in its early years, for instance. This study is, however, the first step in a much larger project that will combine descriptive and explanatory elements. In the first phase, qualitative approaches will interrogate the socio-cultural processes that shape integration across key phases of the strategic process. In the second phase, a survey method will be used to provide a descriptive account of horizontal alignment amongst values-driven functions within large organizations, focused primarily upon elements of organizational structure that facilitate or inhibit alignment. This work will provide insight into ways in which the organizational environment shapes and is shaped by the norms, rules, routines and symbols of actors within organizations’ values-driven business functions. The purpose of this program of work is to be able to illustrate good practice and provide a framework that organizations can apply to evaluate opportunities to improve alignment within their own contexts. The ability to evaluate ways in which values-driven business functions can be aligned, should enable the creation of partnerships towards values-driven business and enhance knowledge sharing between UN Global Compact companies and other organizations within their supply chain. In addition, it will assist scholars in Business Ethics and CSR to design more aligned courses for both graduate and undergraduate courses. The development of E&C and CSR professions could also benefit from this research, as it may allow them to integrate suggestions towards leveraging mutually beneficial forms of cooperation and support in their professional training. Much work remains to be done, but we believe that the insights offered in this paper provide an important first step in the direction of more aligned values-driven business functions. The International Centre for Corporate Social Responsibility (Nottingham University Business School) has incorporated the ICRS Competency Framework in its CSR and Responsible Business core curriculum and MOOC teaching. See https://crsinpractice.info/. De George, R. A. (2015). History of Business Ethics. Retrieved August 2016, from https://www.scu.edu/ethics/focus-areas/business-ethics/resources/a-history-of-business-ethics/. Desio, P. (2005). An overview of the organizational guidelines. An overview of the Unites States Sentencing Commission and the Federal Sentencing Guidelines (http://www.eoa.org. 2005). Ethics and Compliance Initiative. (2016). www.ethics.org. Accessed Aug 2016. Giordano, S. (2011). http://www.cmswire.com/cms/information-management/grc-the-evolution-chief-ethics-and-compliance-officer-role-011557.php. Accessed Aug 2016. Treviño (2010) https://www.youtube.com/watch?v=bdlGaYCk710. Accessed Aug 2016.